Neil and I just finished three interviews with the local media. Thanks to Minnesota Trails magazine, the Champlin-Dayton Press and QCTV for their interest in the TSH mission and the 2007 RAAM. I'll get these up on the blog as soon as they are published/air! THIS is Team Strong Heart. Ten outstanding and dedicated crew members who put so much of their hearts and souls into the mission that mere thanks can't seem to cover the sacrifices that they made. Four slightly mental, but passionate, cyclists who love the sport so much that they would gratefully tackle the world's toughest bicycle race. Dozens of family and friends who gave up their time with us and supported our efforts as we prepared and competed, we are lucky to have you all in our lives. All of you have been an inspiration! YOU are Team Strong Heart. I've been overwhelmed with heartfelt gratitude for all of our corporate sponsors who donated funding and services and to all of our supporters who donated funding and bought TSH t-shirts and jerseys in support of our mission. I am in awe that orders and donations are still rolling in! 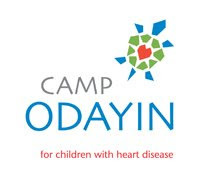 It's been a dream that so many joined us to sponsor campers, expand programs and generate awareness for Camp Odayin! There are well over 200 kids who will attend camp this summer and will have a wonderful experience in part due to YOUR generosity and support! Thank you all so much! You've helped make a bunch of dreams come true! The more I think about this race, the more impressed I am with our crew. Why the crew doesn’t get a medal is beyond me. Can you imagine driving across the country at 20 mph? The bike was a time of peace and enjoying the trip. If you couldn’t ride during this, well, I don’t know what I would do. Many of the you were not cyclists and yet you were there for us every step of the way, simply incredible. Thank you to all the crew members who made this possible; you did an incredible job!! The crew allowed the cyclists to live a sort of dream life on the road. It is the closest thing I will ever get to in terns of stage racing or understanding what that is like. I never thought I would be at dinners celebrating a race that I had participated in. I never thought I would be able to relate to racing or an event where so few have finished. I am not a racer but I love to ride my bike. This made me feel like a racer, I even shaved my legs!? I can’t thank you all enough for providing this opportunity and putting up with so much and keeping a level head! Sorry about the night I was so cranky. I hadn’t slept for two days and I was mad at myself and took it out on you. That was entirely inappropriate. In fact, I wish I would have understood what an incredible job you were doing at the time. I should have been praising you from beginning to end for even making the adventure possible. Without the crew I would have never had this "once in a lifetime" experience. There was talk of doing another one and my wife reminded me that it was a "once in a lifetime" experience. I still think I might be able to slip away when the kids are older! If I do, I hope I have the same crew. A crew that did the job no matter how filthy the task might be or how tired the crew member might be. To Bill and Bernie, thanks for all of your work on this too. This wouldn’t have happened without your endless hours of sacrifice. I know that a lot of your equipment and personal capital went into this trip and I appreciate it. Thanks Bernie for letting me in on this adventure and for training with me through the winter. The training was fun and necessary to do as well as we did and for me to actually feel like I had a part in our third place finish. Greg, it was great riding with you and getting to know you! Thanks! And Tim, I will never forget our last night together! A week out from this trip and I am simply thrilled I got to do it. I have all of you to thank and I sincerely can not thank you enough. I will never forget your sacrifice for this mission and I want you to know just how important you were to our accomplishing this goal. You, the crew, were the reason this worked at all. P.S. A special thanks to Camp Odayin and a note that we are not done working for you. 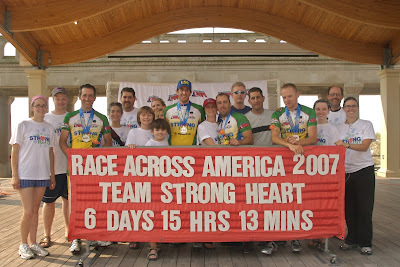 There are a number of people that want Team Strong Heart to grow and do other events to support Camp Odayin. There is an energy here that is real and we are working on ideas to ride for Camp Odayin and to spread the word! Team Strong Heart is growing as we speak!